You know how sometimes you read a recipe and it sounds great, so you go at it with gusto only to find out it was nothing like you imagined? I had that problem with this, the “Inspired By Spaghetti With Clam Sauce” recipe in 1,000 Vegan Recipes. Now, if you’ve read this blog for any length of time, you know how much I love all things Robin Robertson. I’ve never had a flop with one of her recipes. There have been some I don’t like as much as others, and some that weren’t good enough to put on high rotation, but this is the first time I can honestly say that I didn’t like something from one of her cookbooks. The problem may have been my expectations rather than the recipe itself. When I read “clam sauce,” I pictured a creamy white sauce with bits of bean floating in it. 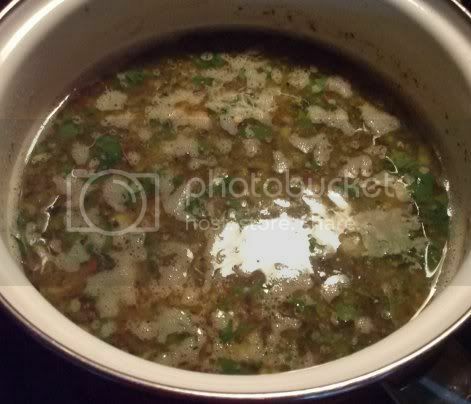 Instead, the recipe produces a clearer, oil-and-broth sauce seasoned with kelp powder and hot pepper flakes. 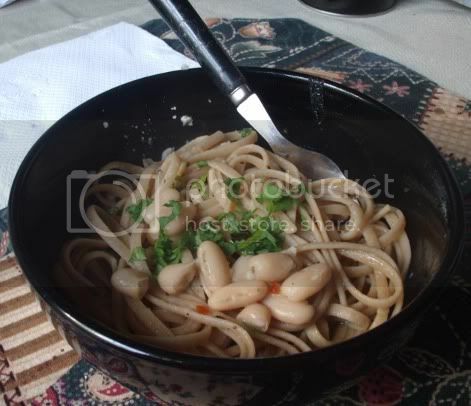 When I tried to coat the pasta with it, most of it drained off and all the beans sank to the bottom. 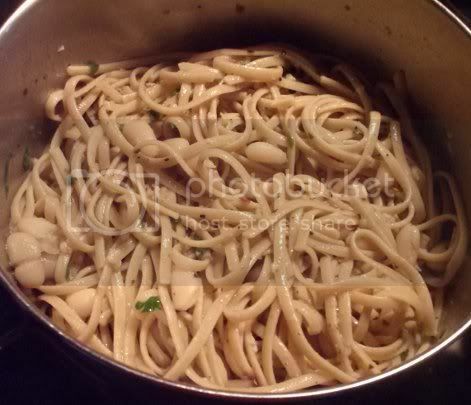 I did use whole wheat linguine instead of spaghetti, but that shouldn’t have made a difference. I wound up serving this in bowls to avoid making a huge mess. Even though the rest of the family enjoyed it, I just couldn’t warm up to this dish. I found it to be disappointing and a bit bland, nothing like the slightly fishy, clam-like sauce I was expecting. I did enjoy shellfish and some mollusks before going vegan, so I was kind of hoping for a throwback to those dishes. Alas, no dice. I did have a couple of ideas for making this more how I was picturing it. One, more kelp powder. The fish-like taste that seaweed imparts is a lot more enjoyable to me than actual fish, and that’s what I was looking for when I made this. Two, I would stick an immersion blender in the pot for a bit to liquefy some of the beans and incorporate them into the sauce. And three, this definitely needs a longer cooking time than what’s suggested in the recipe. I suspect a big part of why this didn’t taste like a clam sauce is that the beans weren’t in the pot long enough to pick up the seasonings. So, lesson learned…even our favorites can disappoint at times. That, and it pays to read a recipe for what it actually says, rather than how I think it should turn out. Question for the comments: Was there a recipe that you had high hopes for that wound up disappointing you? Did you cook it again and, if so, what changes did you make?